Dragon Ball Z 13: Dragon Fist Assault!! If Goku Can't Do It, Who Can? Plot Summary: The Z Warriors discover an unopenable music box and are told to open it with the dragon balls. 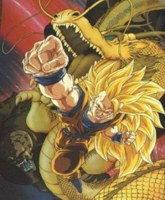 The contents turn out to be a warrior named Tapion who had sealed himself inside along with a monster called Hildegarn. Goku must now perfect a new technique to defeat the evil monster.